Informal Q&A session for prospective rally entrants at Power Boats. The Nereid's Rally is set to be bigger and better in 2019. The duration has been extended by one week and now includes several stops in French Guiana. Participants get to visit Suriname, Roura, Cayenne, Kourou and the Salvation Islands! Because the Nereid's Rally shouldn't just be a regatta for cruisers, we want it to be an excuse for everyone to get out on the water and have some fun! To see what we mean, watch this video (in French). The consensus amongst participants is that all editions of the Nereid's Rally, visiting Guyana, French Guiana and Suriname from Trinidad and Tobago were a great success! Crews were certainly kept busy in Guyana, with tours of the interior, Georgetown and Bartica on offer, plus visits to boutique resorts including Hurakabra, Baganara and Sloth Island. From Saint Laurent du Maroni an equally impressive agenda of activities had crews touring the historic buildings, jungle trekking along the Mana river, and visiting the Amerindian village of Galibi in Suriname. Organisers expect that the Nereid's Rally, will be instrumental in dispelling some of the myths that surround sailing south of Trinidad and Tobago, and that many more yachts will be making the passage south in future. The strong support shown by the Guyanese Minister for Tourism, the Mayor and the Mairie of Saint Laurent du Maroni, is certainly encouraging. The coordination between the Coast Guard, Gendarmerie, ministers police and local officials was exemplary, ensuring a safe, trouble free visit. Plans are already afoot for next years rally where organisers expect to accommodate a much larger fleet. “We are pleased to announce that the annual Nereid's Rally is set to become the regions premiere yachting event, and that local involvement and participation will remain a priority”. How the race that isn't a race proceeded. First leg, Chaguaramas to Guyana. 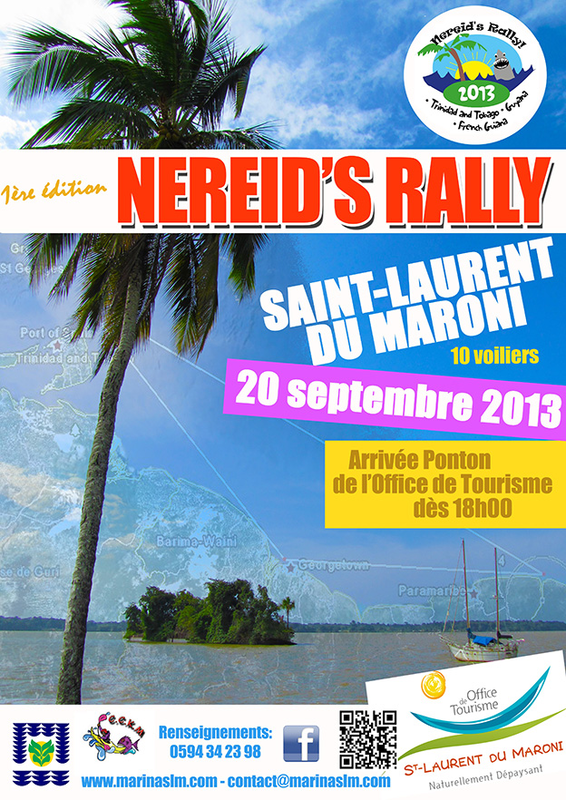 A race to Saint Laurent du Maroni. The official Nereid's Rally user group has been created for rally participants and other interested parties. Be sure to join in and start sharing.